For my second recipe for the USA Dry Pea and Lentil Council, I decided to go with the obvious: hummus. You see chickpeas, you think hummus, right? Well that’s what happened to me when I opened up the box of samples I was sent and saw dried chickpeas. But then I spotted the split peas, thought split pea soup which somehow turned into split pea soup hummus! 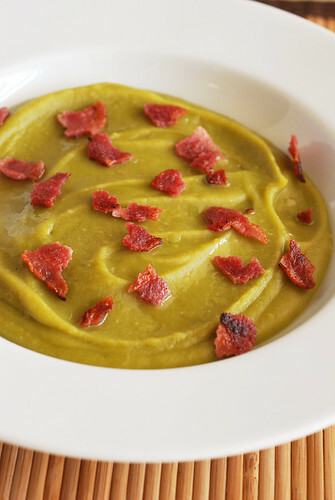 Hummus with all the flavor of split pea soup! Right?! Easy, easy recipe! The best thing about working with dry split peas is that they require no soaking (same with lentils) so the whole shebang took less than 45 minutes. It’s good warm, it’s good cold, it’s good with pita chips, it’s good on a spoon. As a reminder, this recipe is gluten-free but make sure you check your bacon because some brands might contain some weird fillers. Meatless? Try the veggie bacon and vegetable broth. It will work just the same! 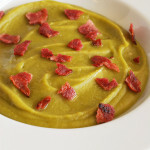 I’ll have one more dry pea recipe for you this week and that post will contain a fun giveaway so keep an eye out! Bring peas, water, and chicken broth to a boil in a medium-sized pot. Cover and lower to a simmer. Allow to cook for about 30 minutes. Transfer to a food processor (or blender) and add the onion powder, ground marjoram, and garlic. Process until everything is blended and creamy. (The hummus will thicken as it cools so add more chicken broth if it seems too thick.) Transfer to a serving dish and sprinkle with crumbled bacon. Drizzle olive oil over top just before serving. I was compensated for my grocery expenses by the USA Dry Pea and Lentil Council but all opinions are my own. 8 Responses to "Split Pea Hummus"
What a great idea, Amanda! I love all kinds of bean dips but would have never thought to use split peas. What a great idea to make hummus with split peas. Yum! What a great idea! I’ve had some great split pea dips but never thought to make a split pea hummus. Love this! What a beautiful color! I love me some dips with cruditÃ©s. Yum! Oh man, that is a thing of beauty. 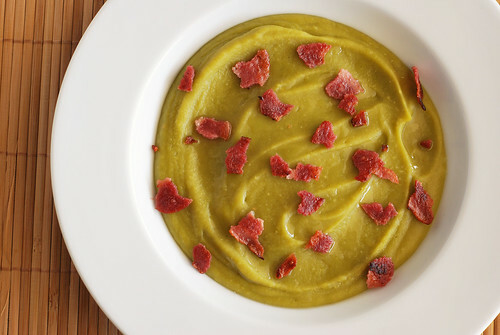 Split pea hummus and bacon, eeee. I love dips and sauces so this is awesome. It reminds me of guacamole too!